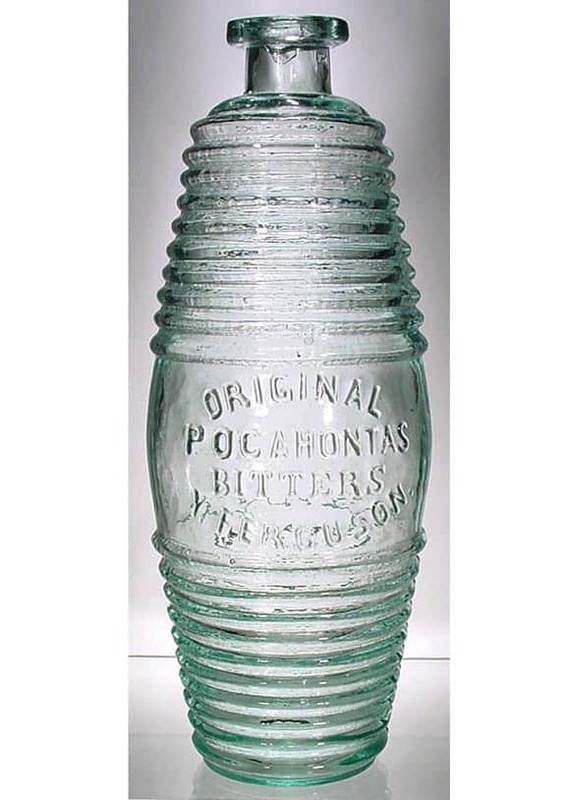 A favorite of any bitters collector, figural collector and possibly many other bottle collectors is the ORIGINAL POCAHONTAS BITTERS. 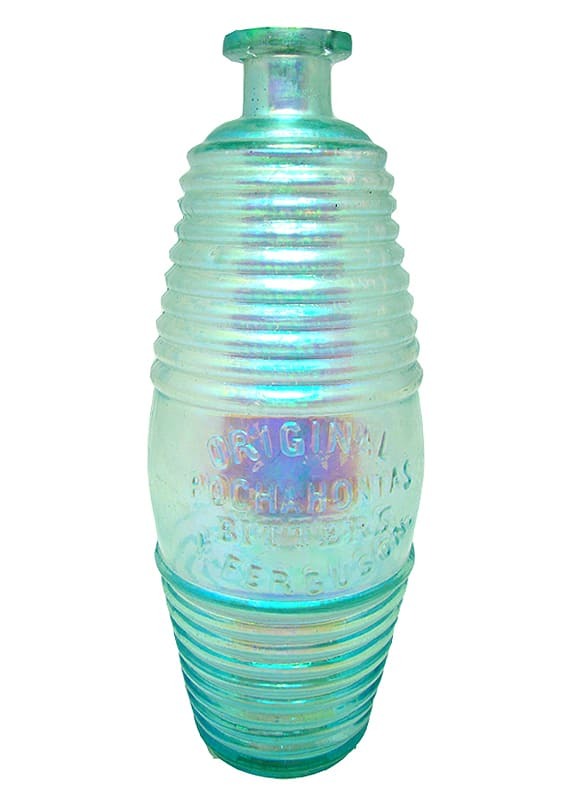 This rare figural barrel has a great historic name, is perfectly proportioned and comes in a drop dead, gorgeous shade of aqua. 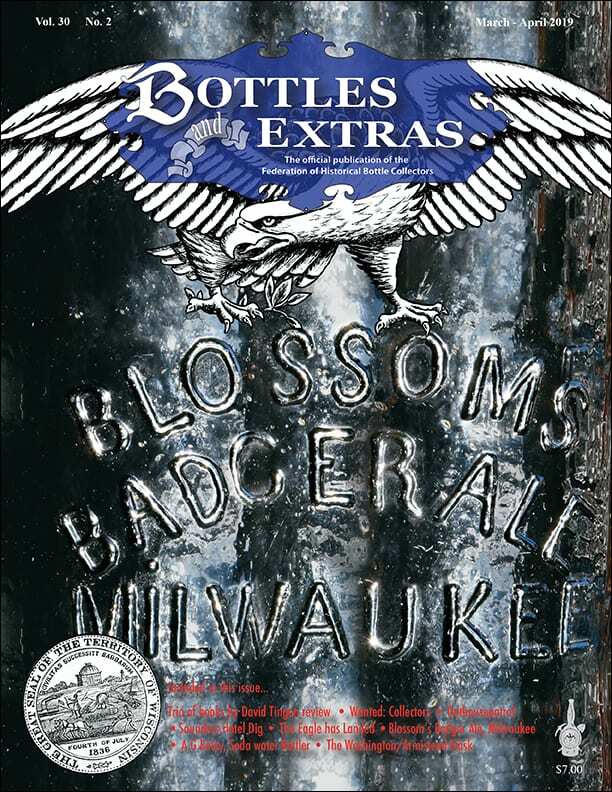 You will not get a color run of these barrels like the other Indian favorite, OLD SACHEMS BITTERS AND WIGWAM TONIC but if you are fortunate enough to possess one, you will most likely isolate it from other barrels, like I do, to celebrate the beauty of the bottle. 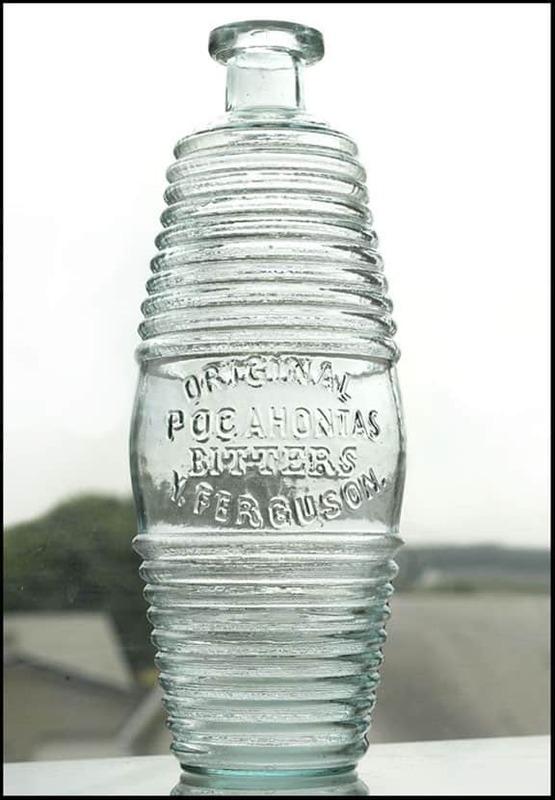 I am actively looking for more information on who made this bottle and where, so if you have any information, please forward. 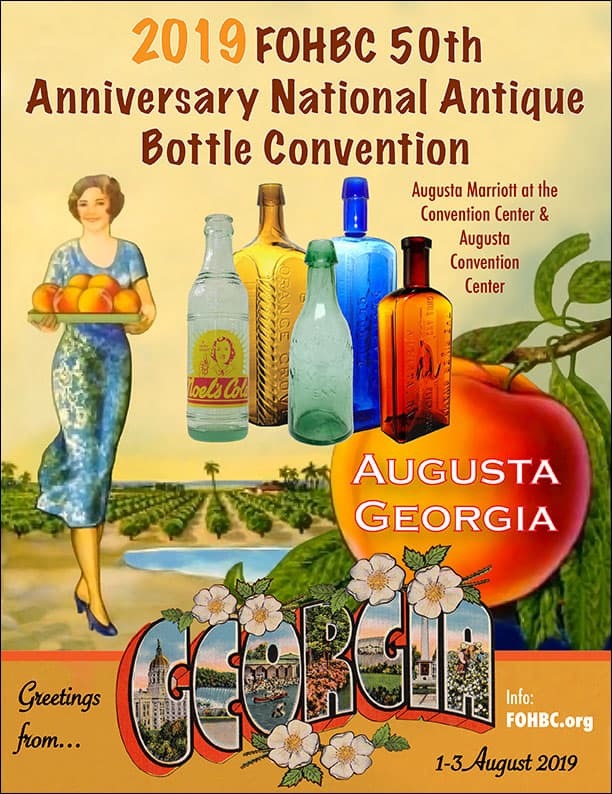 Based on new material provided by bitters authority Ted Krist at the 2018 Cleveland National, we now know that there was a ‘Yates’ Ferguson who is the “Y.” Ferguson embossed on the bottle. This makes finding information a bit easier. 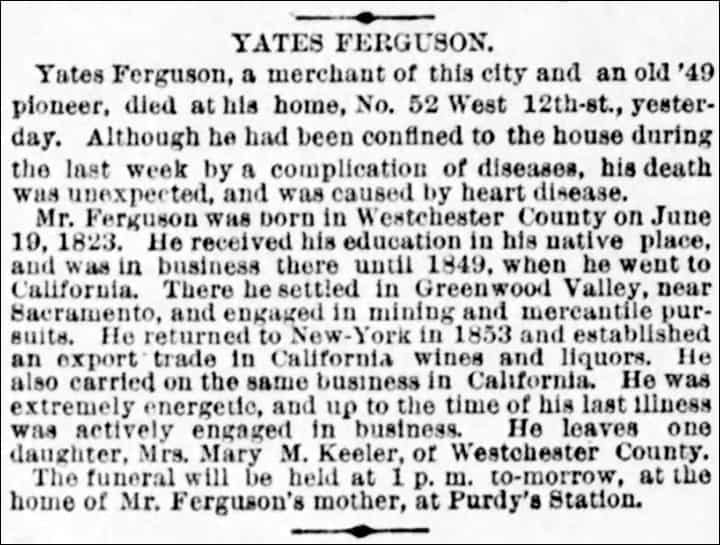 Yates Ferguson was born in Westchester County, New York on 19 June 1823 and migrated like many young men to California in 1849 for the gold rush. He settled in Greenwood Valley near Sacramento and engaged in mining and mercantile pursuits. The California Gold Rush started when gold was discovered at Sutter’s Mill in 1848. The arrival of prospectors in droves ruined Sutter’s New Helvetia and trade began to develop around a wharf he had established where the American and Sacramento Rivers joined. 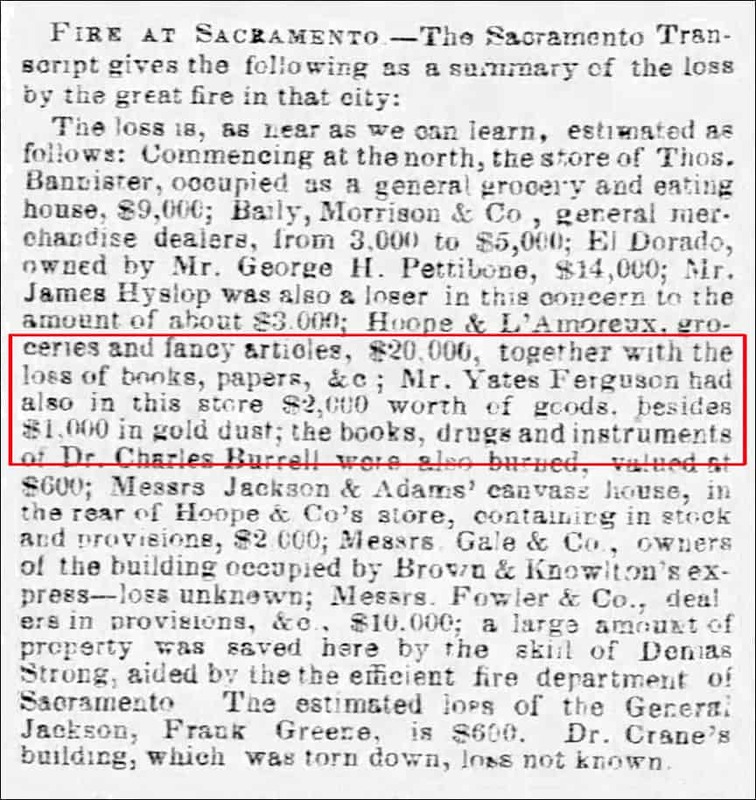 In 1850, Ferguson lost his establishment and goods to a fire in Sacramento. First a major flood devastated the city that year. Rain from heavy storms had saturated the grounds upon which Sacramento was built, and the American and Sacramento rivers crested simultaneously. In April of the same year, the city experienced its first major fire. A second fire in November destroyed a number of commercial establishments in the city, including Yates Ferguson. Ferguson returned to New York City in 1853 and established an export trade in California wines and liquors. He also carried on the same business in California. 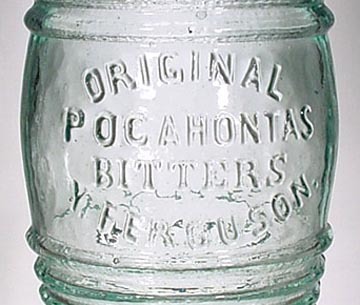 I suppose that somewhere between 1855 and 1860, he put out the Pocahontas Bitters. We are still tying to establish the exact date. Yates Ferguson died at home in New York in 1887. 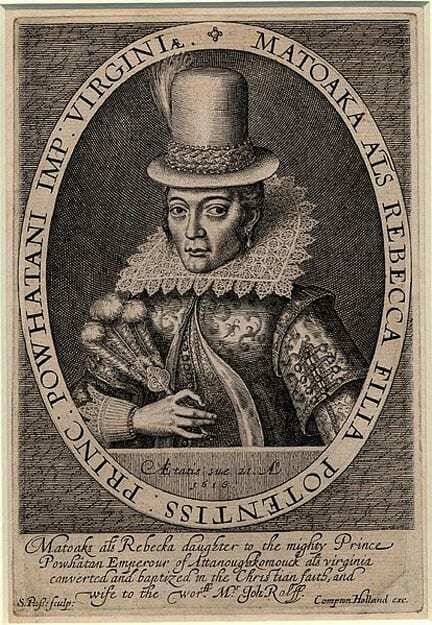 [Wikipedia] Pocahontas (born Matoaka, and later known as Rebecca Rolfe, c. 1595 – March 1617) was a Virginia Indian notable for her association with the colonial settlement at Jamestown, Virginia. She was the daughter of Chief Powhatan, the head of a network of tributary tribal nations in the Tidewater region of Virginia. In a well-known historical anecdote, she is said to have saved the life of an Indian captive, Englishman John Smith, in 1607 by placing her head upon his own when her father raised his war club to execute him. Pocahontas was captured by the English during Anglo-Indian hostilities in 1613, and held for ransom. During her captivity, she converted to Christianity and took the name Rebecca. When the opportunity arose for her to return to her people, she chose to remain with the English. 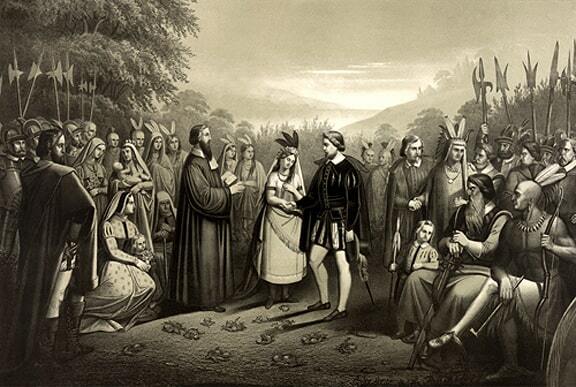 In April 1614, she married tobacco planter John Rolfe, and, in January 1615, bore him a son, Thomas Rolfe. In 1616, the Rolfes traveled to London. 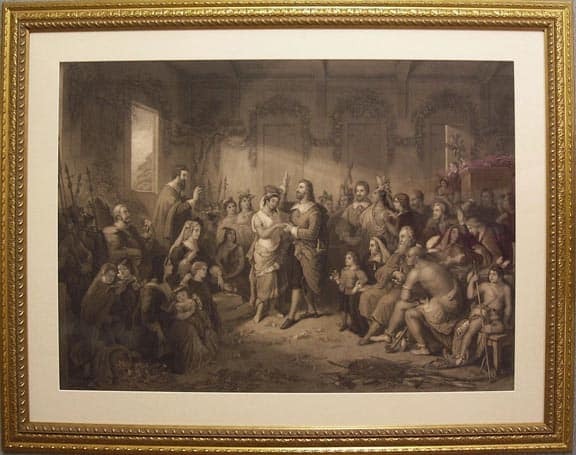 Pocahontas was presented to English society as an example of the civilized “savage” in hopes of stimulating investment in the Jamestown settlement. She became something of a celebrity, was elegantly fêted, and attended a masque at Whitehall Palace. In 1617, the Rolfes set sail for home, but Pocahontas died at Gravesend of unknown causes. She was buried in a church in Gravesend, but the exact location of her grave is not known. 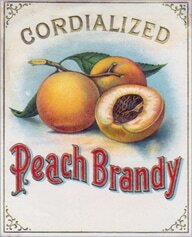 Numerous places, landmarks, and products in the United States have been named after Pocahontas. Her story has been romanticized over the years, and she is the subject of art, literature, and film. Her descendants through her son Thomas include members of the First Families of Virginia‎, First Ladies Edith Wilson and Nancy Reagan, astronomer Percival Lowell and American reality television personality Benjamin Wade. 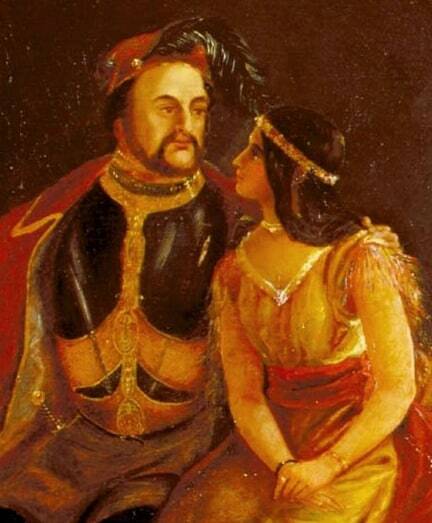 John Rolfe and Pocahontas; Rolfe was the first Englishman in America to cultivate tobacco. Painting by J.W. 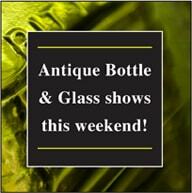 Glass, early 1850s. Fought between English settlers of the Virginia Colony and Indians of the Powhatan Confederacy, this was a series of three intermittent conflicts which lasted from about 1910 through 1646. 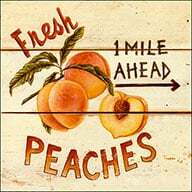 The first war started in 1609 or 1610, after the the relationship between the Powhatan Indians and the English had soured due to the English demands for food. That winter of 1609-10 is known as the “Starving Time.” During that winter the English were afraid to leave the fort, due to a legitimate fear of being killed by the Powhatan Indians. As a result they ate anything they could: various animals, leather from their shoes and belts, and sometimes fellow settlers who had already died. By early 1610 most of the settlers, 80-90%, had died due to starvation and disease. Peace and improved relations occurred after English settler, John Rolfe, married Pocahontas, the Powhatan Chief’s daughter, in 1614. A few years later, in 1617, Pocahontas died and the following year, her father, Chief Wahunsunacock also passed away. His succession was briefly passed on to his younger brother, Opitchapam, and then to his next younger brother Opechancanough. On March 22, 1622, Opechancanough, tired of English expansion, planned a coordinated attack on the English settlements. Because of a young Indian boy’s warning Jamestown itself was spared. Many outlying settlements were attacked and of a population of about 1,200 settlers about 350-400 were killed. After the, the Powhatan Indians withdrew, as was their way, to wait for the English to pack up and leave. However, the English did not leave and more conflicts arose and continued on and off for the next ten years, with few decisive victories. The settlers gave up the idea of coexisting with the Indians to begin a policy of extermination. By 1632, the Powhatan were pressured into land concessions in the western area of Chesapeake Bay. 1823: Yates Ferguson born in Westchester County New York on 19 June 1823. 1849: Ferguson migrated to California in 1849 presumably for the gold rush. He settled in Greenwood Valley near Sacramento and engaged in mining and mercantile pursuits. 1850: Yates Ferguson lost his store and goods in a fire in Sacramento. 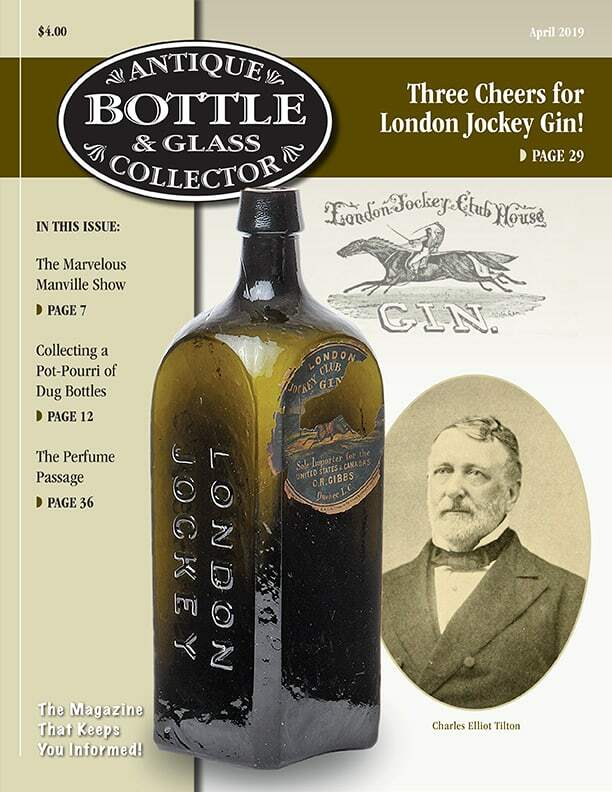 1853: Yates returned to New York City in 1853 and established an export trade in California wines and liquors. He also carried on the same business in California. 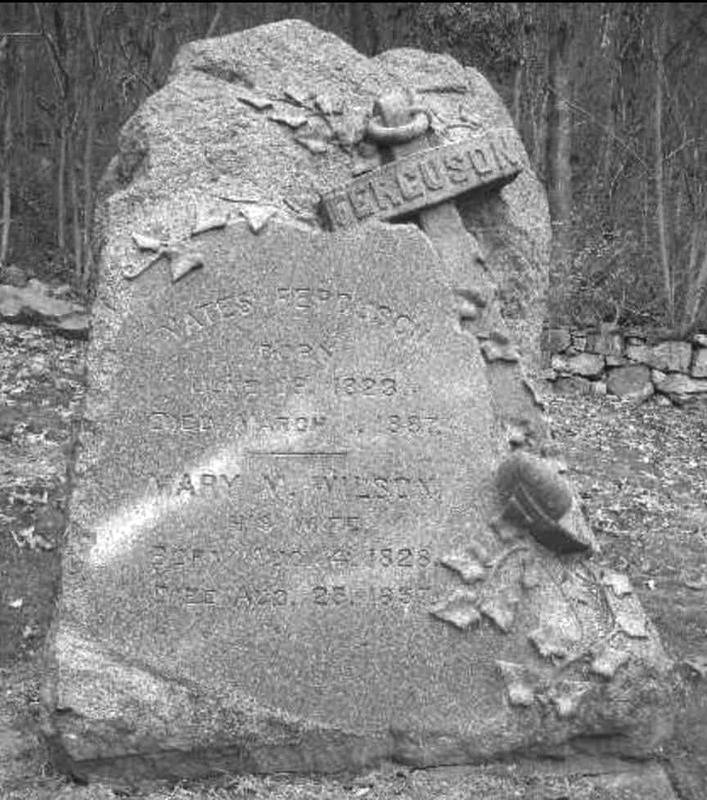 1887: Yates Ferguson death at home in New York. Addressed at No. 52 West 12th Street. 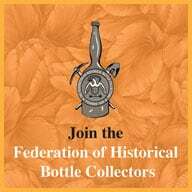 This entry was posted in Bitters, Figural Bottles, History and tagged Barrel, Bill Ham, bitters, Chief Powhatan, Figural, Gold Rush, Indian, J.W. 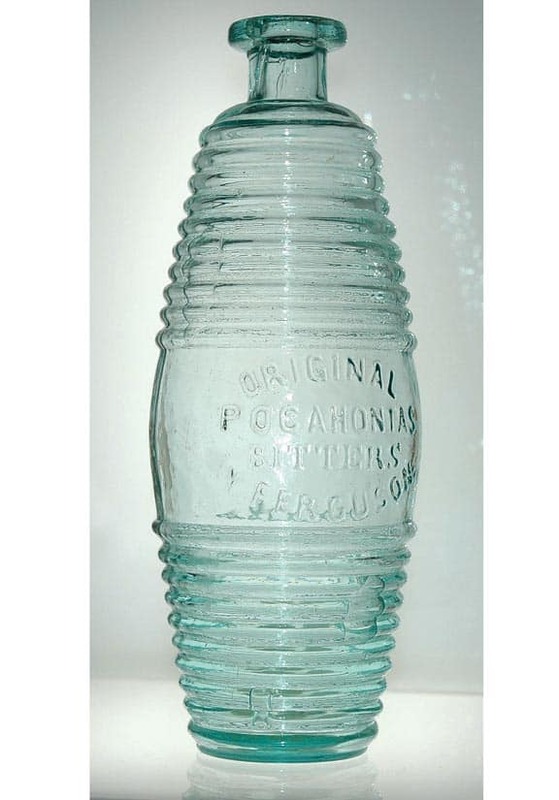 Glass, Jamestown, John C. McRae, John Smith, liquo, Matoaka, merchant, New York, Opechancanough, Original Pocahontas Bitters, Pocahontas, Rebecca Rolfe, sacramento, San Francisco, Simon van de Passe, Ted Krist, Virginia, Westchester, Y. Ferguson, Yates. Bookmark the permalink. Besides the rough pontil mark on one of my two aqua Original Pocahontas barrels, the flanged lip on the pontiled variant is thicker and more massive. Both are mint in every respect. 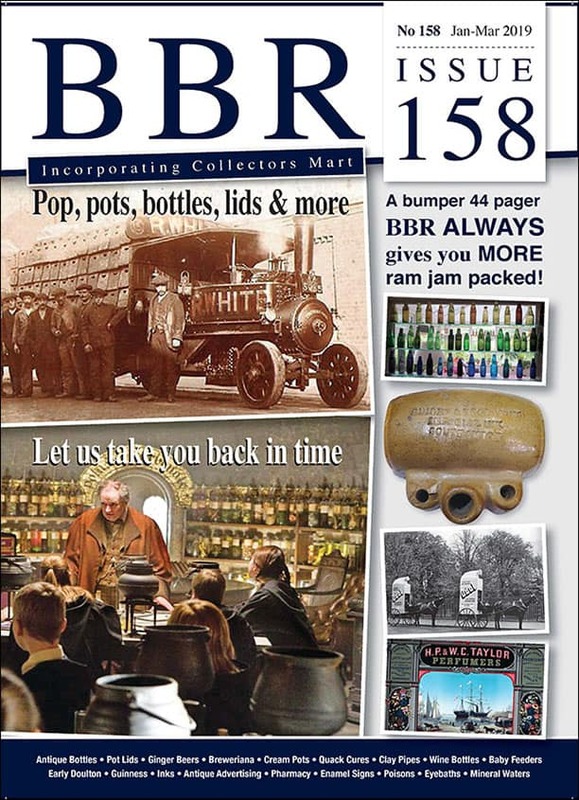 Updated post with O 86.1 variant information from Bill Ham. Was reading the 2018 update to your Pocahontas Barrel Bitters research. I have something that I would like to add regarding the timeline on these bottles. I think they are a little later than the 1855-60 date that you surmised. Based on digging context and the Yates Ferguson timeline that you established in your post, I would put these barrels from 1860 – 1867 when he was listed as living in San Francisco. I am aware of three intact non-pontiled examples that have been dug in Benicia, CA over the past 55 yrs. Two of these were in different privies with 1860s context. The third example came out of the mudflats, where the context at that depth varied from 1850s to 1890s. 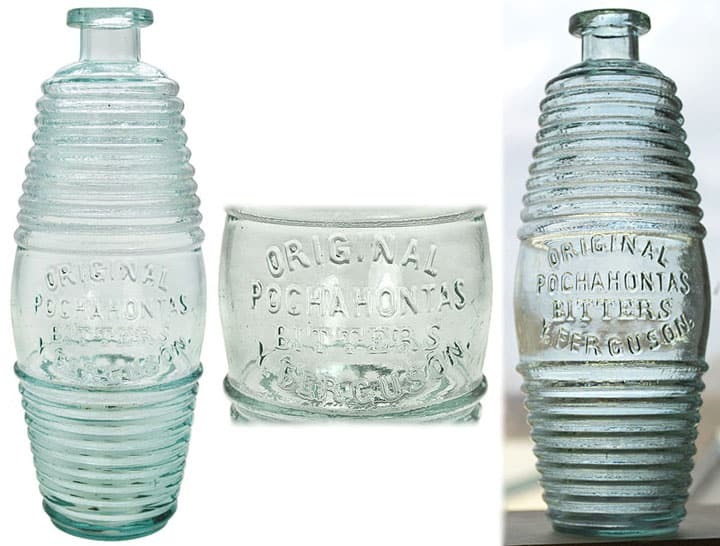 I have always thought that there was a “Western connection” with these bottles, since they have shown-up out here broken and intact over the yrs. After reading your history of Yates Ferguson, and knowing he was living here and had businesses here in Sacramento and S.F., I am almost sure that he distributed these in the West during his time here. The timeline fits very well with the context of holes where these have been dug.